Though I had studied art history extensively and always found myself drawn to the simpler, more austere paintings and architecture, I found myself falling head over heels in love with Gothic cathedrals the first time I went to France when I was 20. That was a very long time ago, but those buildings and the incredible light that danced through the brilliant Rose Windows high up in the grey walls have stayed with me. Fast forward a few decades. 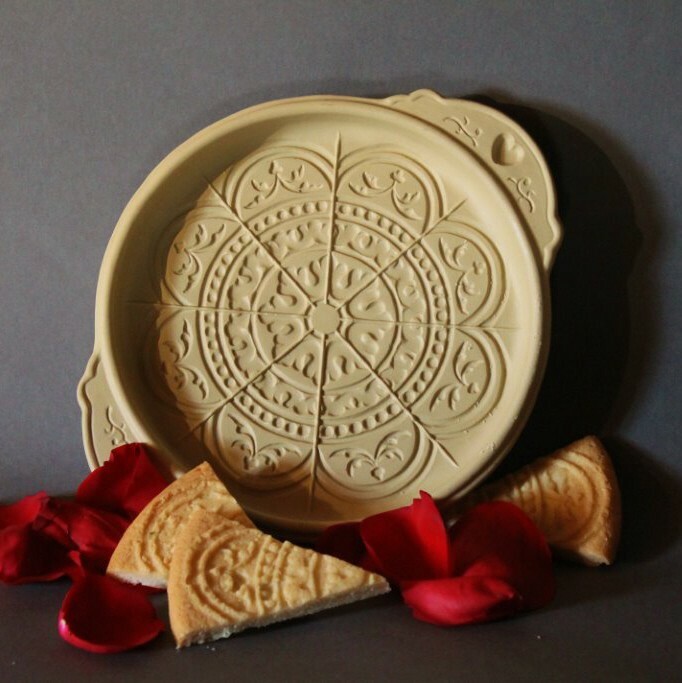 I am now combining my love of sculpture and my love of all things cookie, making Brown Bag molds, stamps and shortbread pans. All depict images of animals, flowers, butterflies and figures. Some are playful, some sweet, some fancy. Not a single one is pure design. Even the hearts are decorated with images of flowers and birds. Then a couple of years ago when I was officially designated as a “senior” not only in movie theaters and on airplanes but according to the government, I thought, “Nuts. I am old enough to do whatever I want. I love flowers and animals, and they fill my life, but I love design and symmetry, balance, grace and harmony with no reference to the living world, too”. So I went back in my mind to those beautiful windows I had seen as a young woman. The Rose Window Shortbread Pan is the result. I love the design not only because of the harmony of the whole uncut round, but also for the elegance of each individual slice. Even sitting at my kitchen table, wearing jeans and a tee shirt, I feel very refined as I nibble a piece of shortbread and drink a cup of afternoon tea. 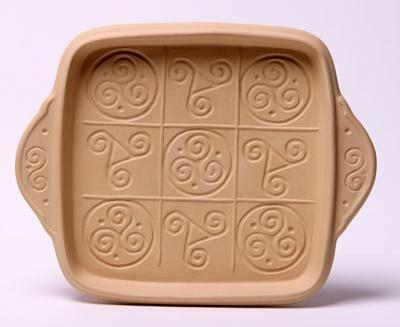 My friend just moved into her first home and she loves to bake- I would love to get her this mold as a housewarming gift- I live in Buffalo NY, and cannot seem to find any store in buffalo that sells this item, or any of the brown bag molds. Your store locator doesn’t list any stores that would carry it, but to buy on line is costly because of the shipping charge- a little to much for the pocketbook. Any suggestions? I have been making shortbread pans for a long time, now, and many used ones can be found on e-Bay. Sometimes people find one in a thrift store. These pans won’t have boxes, they may be “seconds”, and many won’t have booklets, but you can download instructions and recipes from the website. And they still work. I have baked shortbread in your pans for decades. Joy and warm memories of bringing family, church and friends together remain among a few overlooked crumbs. It is time, once again, to purchase another shortbread mold but it will be difficult. I cannot decide which one it will be. It may have to be two or three. It appears I may be baking our son’s Wedding Groom’s Cake, shortbread instead, next May. 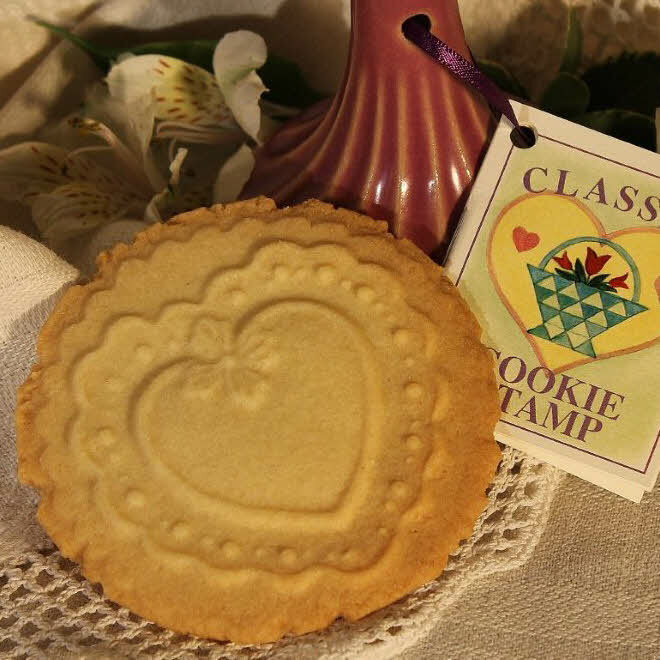 How lovely an occasion to share this heavenly treat of beauty, tradition and melt-in-your-mouth joy! Thank you for the times you brought us together… North and South . . . across the Midwest!